Appearing at Prestigious Folk Alliance International Conference February 15-19, 2017. 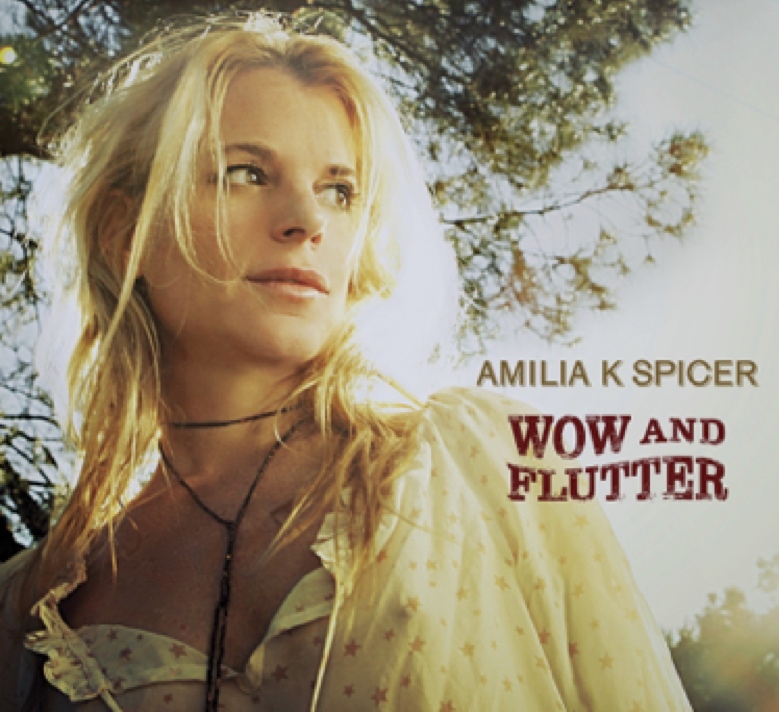 Americana songstress Amilia Spicer will release her third album, Wow and Flutter, on April 28, 2017. Spicer is also set to exclusively premiere the music video for “Fill Me Up” from Wow and Flutter on February 14 via TheBluegrassSituation.com, in advance of the Folk Alliance festival. The video was filmed in the very woods she explored as a child in rural Pennsylvania and features scenes of Spicer re-discovering those woods while playing the song. Spicer will perform songs from the new release during her Thursday evening Official Showcase at the prestigious Folk Alliance festival, which takes place in Kansas City, MO on February 15 -18, 2017. Wow and Flutter is Spicer’s most compelling work to date. The songs map her musical DNA in landscapes of languid farmlands, gritty alleys and red dirt noir. Her lyrics reflect the various places she calls home; Pennsylvania where she was raised, and Los Angeles and Austin where she currently splits her time. She visits her father’s hometown of Harlan Kentucky on the track “Harlan” as well. Spicer has recruited an all-star line-up for Wow and Flutter. Keyboardists Rami Jaffee (Wallflowers, Foo Fighters) and Mike Finnegan (Bonnie Raitt, Taj Mahal) contribute, as does Woody Guthrie disciple and singer-songwriter Jimmy LaFave, alongside bassist Daryl Johnson (Stones/Dylan). Guitarists Tony Gilkyson (X, Lone Justice) and Gurf Morlix (Lucinda Williams) appear as special guests. Spicer, previously known for her piano work, picks up a multitude of instruments on Wow and Flutter, from guitar to banjo to lap steel. She also produced the record, alongside multi-instrumentalist Steve McCormick. Malcolm Burn, whom Spicer contacted because of his work with Daniel Lanois, handled mixing. Amilia Spicer’s own label, Free Range Records, will present private showcases from their “Free Range Records Presents” room at the Folk Alliance festival. This room, #604, will also feature artists from the Kerrville Folk Festival on Friday night, February 17. All of this is in addition to Spicer’s own Official Folk Alliance festival showcase, which takes place at 7:45pm on Thursday Feb 16 in the Brookside Room. When Spicer answered music’s call, she was first discovered at a Los Angeles club. That led to a rare main stage Kerrville Folk Festival debut, three Kennedy Center performances, song placements in several high-profile TV productions (Party of Five, Dawson’s Creek), and more. Spicer’s first two releases, Like an Engine and Seamless were released to critical acclaim, with New Texas Magazine calling Spicer “A formidable talent.” Spicer’s music has also earned comparisons to that of Lucinda Williams, Emmylou Harris, and Lanois. During the writing process for Wow and Flutter, Spicer took time to work on several other projects. Among these, she has been lauded for her contributions to Cinnamon Girl: Women Artists Cover Neil Young and A Case for Case: A Peter Case Tribute with John Prine. She also appeared on the 2009 Safety Harbor Kids Holiday Collection, alongside Jackson Browne, Sheila E, and Paul Barrere. Spicer has enjoyed other collaborations as well, most notably appearing on albums by John Gorka and the final Rounder release from the late Bill Morrissey.